Numatic GVE 370-2 George with Cleanstore LITE Kit - Carpet Extractors - CleanStore. Numatic GVE 370-2 George with Cleanstore LITE Kit. The George GVE 370-2For those who only require Carpet, Hard Floor & Wet Vacuum. Ideal for carpet and upholstery cleaning. Scrubbing and Squeegee tool for hard floors. Fishtail and Upholstery nozzles for carpet and upholstery. If you have any questions please contact cleanstore UK before purchasing. Please note we only supply UK products. Any electronic items will come supplied with a standard UK Plug. Numatic George GVE370-2 with Lite Kit , Carpet Extractor & Wet Vacuum for hard floors , carpets and upholstery. If you have no use for the dry tool kit and you are only going to use the machine for wet use tasks then this is the machine for you. Based entirely on the design of the Cleantec professional machines, this machine is totally at home as a wet vacuum or carpet and upholstery wet extractor/ cleaner. In fact the only difference from the professional version of this unit is the hose length. This domestic version of the Cleantec CT370-2 will work long hours and give professional results. This great machine packs a powerful punch whatever the task from wet vacuuming, scrubbing and drying of hard floors, deep cleaning the carpet or upholstery to unblocking the sink. Whatever the task, George GVE 370-2 is there to make those difficult jobs nice and easy. The combination of the industrial Twinflo motor and powerflo pump system ensures professional cleaning standards. George GVE 370-2 is also available in A26A and plus mode to deliver a machine that will most suit your requirements (see links to the right of this page). You can also upgrade the fishtail on the carpet wand to metal should you need to clean lots of carpets on a regular basis. Multi-Tasking (Wet Use) Carpets & Upholstery & Hard Floors. Powerful Powerful commercial grade 1200 Watt Vacuum Motor and Powerful Solution Pump. Tough Industrial Strength Base with removal integral solution tank. Wet Use Only Kit All the tools for wet vacuum, carpet and upholstery cleaning. Range Three models to suit your use Lite, A26A and Plus (see right for links). Detergent Includes Numatic Solution (500ml). Economical Why pay for the dry tools if it is for wet use only. You May Also Like Other machines that may suit your requirements (see right of page). George GVE370-2 with A26A Kit A All In One Multi Use machine, Dry Vacuum (hoover), Wet Vacuum, Carpet & Upholstrey Cleaning, Wet Cleaning of Hard Floors. 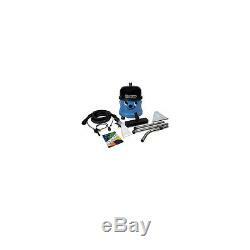 George GVE370-2 Plus As per the George - A26A, plus a Turbo Airo Brush and a full chemical kit for Carpet and Upholstery Cleaning, inc Detergent (Carpet & Upholstery), Spot Cleaners, and Anti Foam to protect the vacuum motor. Numatic Charles CVC370-2 For those who want a wet vacuum only with no pump for carpet and upholstery cleaning. Henry Extra Dry Vacuum (hoover) only. 9L Wet, 6 / 6L Extraction. 3m Extraction/ 1.9m Vacuum. Extraction Wand, Hand Tool, Hard Floor Tool. Machine - 2 years, Accessories - 6 months. All other parts hoses, pipes and tools etc. The item "Numatic GVE370-2 George Wet & Dry Bagged Vacuum Cleaner with LITE Kit" is in sale since Sunday, October 4, 2015. This item is in the category "Home, Furniture & DIY\Appliances\Ironing & Vacuuming\Vacuum Cleaners". The seller is "cleanstoreuk" and is located in Salfords Nr Redhill, Surrey. This item can be shipped to United Kingdom, Finland, Germany, Greece, France, Italy.